Valentino Rossi has provided Movistar TV journalist Ernest Riveras with an in-depth interview at Misano, covering topics such as his relationship with his parents, his racing idols and his times with Honda and Ducati. 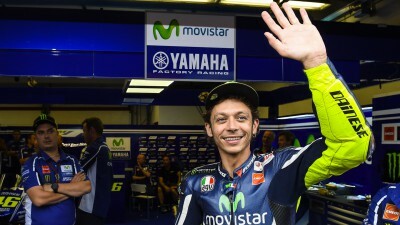 Having qualified on the front row for Sunday’s race at his home track, Rossi is in a good position to produce another memorable performance in front of the Italian fans. With the Misano circuit being just a short drive from his home town of Tavullia this is always a special weekend on the MotoGP™ calendar for Rossi, though of course riding at home brings extra responsibility. Rossi also took the opportunity to clarify recent quotes he had made where it was interpreted that he had regretted his decision to ride for Ducati for two seasons. One thing Rossi says he would not do again is put up a wall between his side of the Yamaha garage and Lorenzo’s side.